The City of Brandon is responsible for providing solid waste collection and disposal for its citizens. The City is currently contracted with Waste Management for residential garbage pickup services throughout the City. Waste Management provides solid waste collection services twice a week for residents. All solid waste charges are billed monthly to each residence by the City of Brandon. Containers must be placed at the curb or end of driveway by 7:00 a.m. on your pick-up day. Garbage must be placed within storage bags or containers to prevent spillage, entry by animals, or the seepage of water into them. 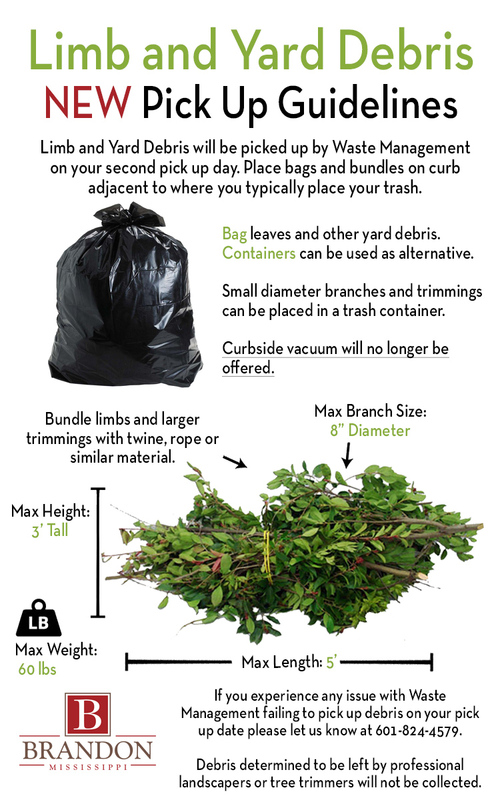 Leaves, brush and grass clippings need to be bagged and placed alongside your other trash. White goods are picked up by Waste Management on your second collection day of the week. Containers shall not be placed at the street prior to the night before the scheduled pick-up date and shall be removed after pick-up has been completed. Pickup for Leaf and Yard Debris will occur on the second pickup day of the week by Waste Management. Limbs shall be no larger than 5 feet long & 8 inches in diameter. Individual limb piles shall be stacked to a maximum of 3 feet in height. Limbs shall be bundled neatly and placed next to garbage at curbside (do not place in street or on/in front of storm drains). There shall be no construction material within limb piles for pickup. Limbs & debris will be picked up on the second pickup day of the week. Limbs placed at curb not in compliance with these standards shall not be picked up. Code enforcement will contact residences with compliance issues to resolve. Trees and limbs cut by a contractor are the responsibility of the contractor to remove per city ordinance – Section 66-45. Small diameter branches and trimming can be placed in a trash container. All yard debris including leaves, grass, and garden debris shall be bagged. Brandon has discontinued use of the vacuum roadside leaf service. Bags and/or bundles shall be placed at the curb, a few feet from your trash cart, by 7:00 AM on the morning of your second scheduled collection day. Leaves or debris shall not be placed in the street or near a storm drain per city ordinance. Code enforcement can issue citations for debris placed directly in the street or gutter. Leaves and debris placed in the street or gutter ultimately get carried by stormwater into our lakes where the nutrients contribute to algae growth. Debris determined to be left by professional landscapers will not be collected.